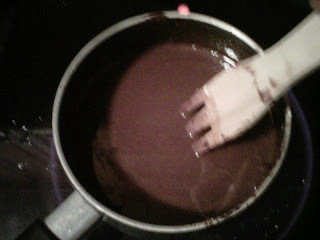 Single Girl Gourmet: Did somebody say ganache? Maybe. Perhaps it was even peanut butter ganache. Are you excited yet? Do you need a quick explanation of what ganache is? Basically, it's fancy frosting/glaze made with cream and butter. It's French. The French like cream and butter. This is why we're friends. A few weeks back, I had my first fluffernutter. We had Fluffernutter Friday at the office. Half of you are appalled and the other half have no idea what a fluffernutter is, yeah I did not really either, but they are delicious. As a result of this culinary adventure, I became acquainted with the idea of fluffernutter cupcakes - but chocolate, of course. Why would you ever make cupcakes any other way? 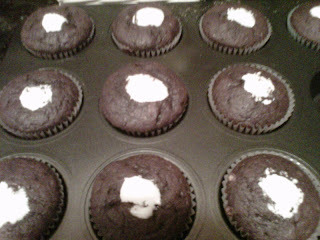 After your cupcakes have cooled, fill your decorator's bag with marshmallow cream. If you are using a ziploc bag, try to fill it will as much cream as you think you'll need the first time, it's very hard to refill (and messy). 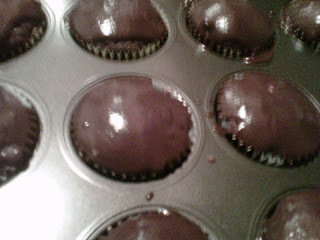 Poke the tip of the bag into the center of each cupcake and squeeze a cream into the center. You need to fill them somewhat aggressively, or you won't end up with any noticeable cream in the middle (this happened to a few of mine). After you've finished injecting the cream, prepare your ganache according to the recipe here. Pour ganache over cupcakes. These were yummy! Make sure to let them cool before injecting the cream, or it will melt out the top. Otherwise very easy and quite fancy seeming = my favorite kind of recipe.